It's perfectly understandable why they should keep the details private. Feral lefties have found out who the skywriting company was and have deluged it with abusive messages. Depressing, but typical. The PC Left are a nasty, bullying bunch. Quack on about love, but motivated by hate. Say they believe in freedom of speech -- but by that they mean "freedom to shout ... other people down". 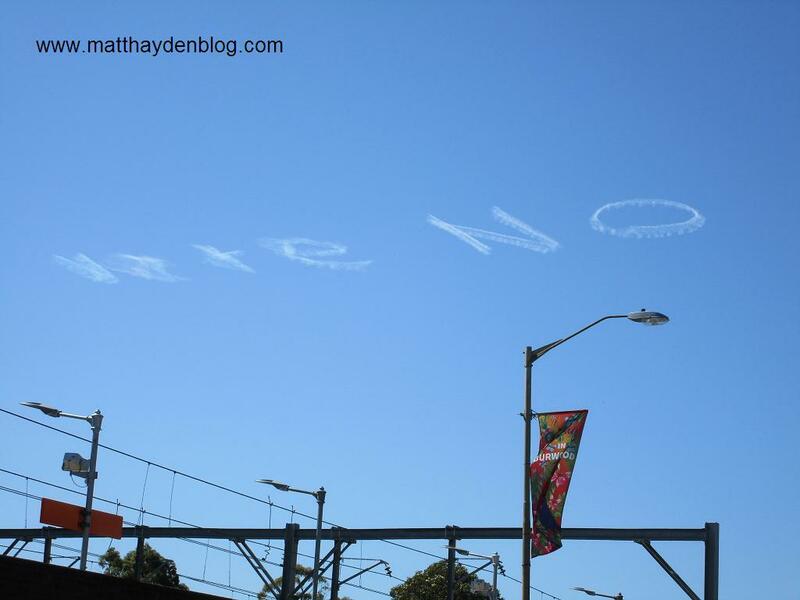 Well, whoever was ultimately responsible for the skywritten message it was a very good tactic. It was guerrila warfare, in a way. After all, there's absolutely no way the "no" camp could've competed on the ground in this city. You've got Clover Moore running a totally one-sided "Vote Yes" campaign, shamelessly using money from ratepayers, some of whom are surely against "marriage equality". Then there are unions and big businesses such as Qantas, along with various leftie organizations -- many of which receive taxpayer funds, no doubt -- all pushing for SSM. Countless impressionable individuals have been caught up in the hysteria, too, plastering stickers and posters thither and yon. Where I am, in Sydney's inner west, they're all over the joint. And it's not just the slickly designed rainbows. There's also grafitti like this. Mass hysteria is not too strong a word! 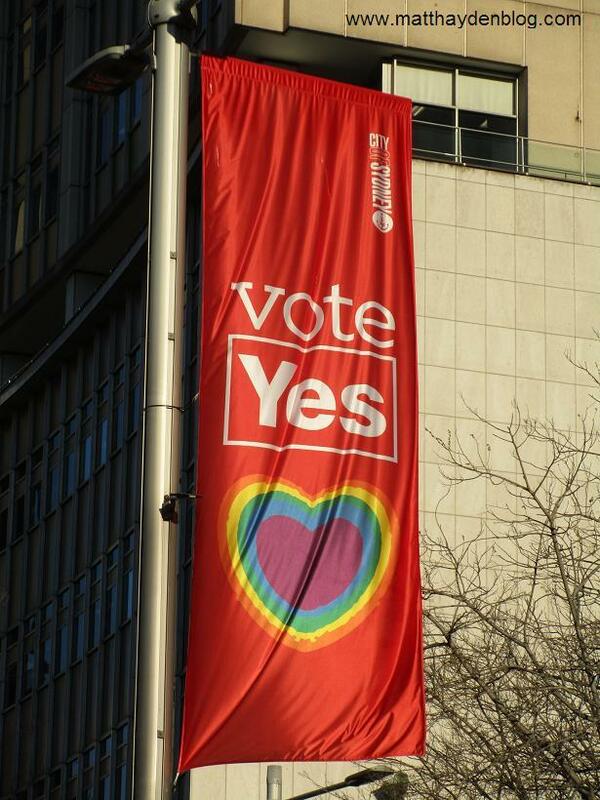 So, for the no camp to get their message out, there was the sheer number of "vote yes" signs to contend with. Then there's the well established habit of lefties tearing down any opposing promotional material. They do it absolutely shamelessly. That's their collective narcissism in action. They keep telling themselves that they are our moral betters, repeating their stupid false narrative in their tiny minds, utterly convinced they can create a utopia through hectoring us all into compliance. They're so totes committed to this child-brained fantasy that they're utterly convinced anything opposing their own totalitarian view must be nothing less than fascism! Therefore, it has no right to be expressed in the first place. Hence the asonishingly inordinate levels of butthurt they suffer if you do so much as utter one word of resistance. So funny that a fave leftie meme is "old man yells at clouds". 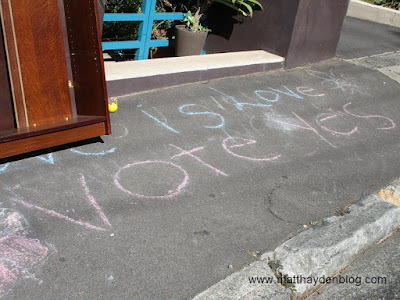 That's what the sneering hipsters were doing all over Sydney on Sunday. Surely it's a crime to arrogate the resources and the power of government to private political purposes? Surely what that woman has done is criminal? Surely it's not legal?